This trumpet-shaped table lamp by Swiss firm Herzog & de Meuron is based on pendant lighting originally designed for a French museum. Launched by Italian brand Artemide at Milan design week, the Unterlinden lamps feature the same pointed metal shade used in the Musée Unterlinden in Colmar, France. Made from die-cast aluminium or bronze, with an antique-style patina and ridged exterior, the Unterlinden lamps sit on tall, slender stems and circular bases. According to Artemide – which also launched lamps designed by Neri&Hu to resemble birds perched on wires – its metal support forms the perfect angle to create non-glaring light for working areas. Herzog & de Meuron also used both pendant and table versions of the lamp for the interiors of another recent architectural project, the Feltrinelli Porta Volta offices in Milan. The Swiss firm is a perennial favourite with Dezeen readers, taking third place in Dezeen Hot List, just behind Zaha Hadid Architects and Bjarke Ingels Group. 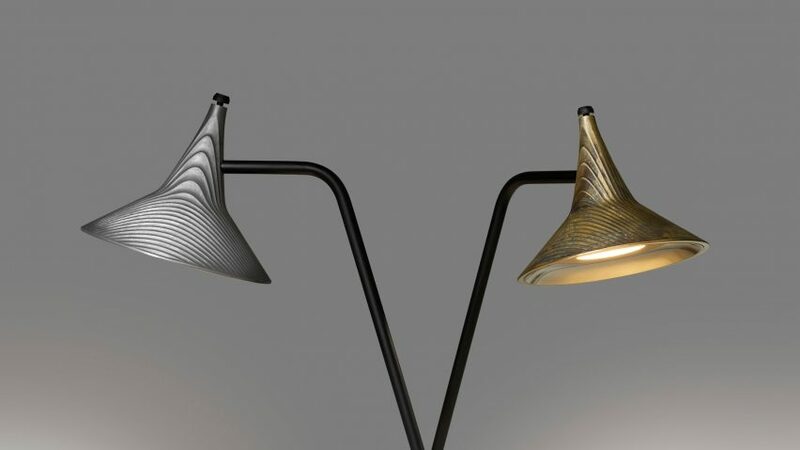 Milan design week saw the launch of several new lighting collections, including a chain-like pendant by New Zealand brand Resident, which was made of separate LED-rimmed rings that connect together. Italian duo Formafantasma put a sculptural spin on the power cable, turning it into a structural part of its Wire Ring lighting, while the newly established Child Studio made globe-like lamps that appeared as if frozen precariously in place.